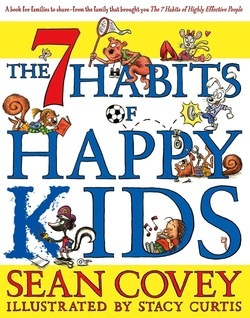 We are learning about the 7 Habits of Happy Kids, by Sean Covey. These are habits that will help us become responsible, organized, balanced citizens! Habit 1- Be Proactive: I'm in charge of me. Habit 2- Begin with the End In Mind: Make a plan. Habit 3- Put First Things First: Work first, then play. Habit 4- Think Win-Win: We can all win. Habit 5- Seek First to Understand, then to be Understood: Listen then talk. Habit 6- Synergize: Working together is better! Habit 7- Sharpen the Saw: Balance feels best in work and play.